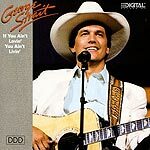 CD review: "If You Ain't Lovin' You Ain't Livin'"
Considering that he does not write any of his own songs, George Strait has repeatedly done very well in selecting material for his albums. "If You Ain't Lovin' You Ain't Livin'" is no exception. Mixing upbeat country swing with slow ballads, Strait again shows why he is continually at the top of the country charts. The title track is a humorous look at loneliness and how it cheapens material possessions, while "Famous Last Words of a Fool" is a traditional cynical country view of love and life. Strait's band, as always, is solid, with bassist David Hungate coming off the most recent Chet Atkins recordings. Strait may not set the world on fire with innovation or daring artistic bravado, but his steady voice and excellent musicianship, combined with a talent for finding fresh material, will keep his audience loyal for a good many more years.